Today is the 2nd anniversary of Rooftop Reviews, a mile stone which I never thought of back then when I began this blog. I got about 15 hits a day at the time, and was amazed! I now get over 10 times that, and have soared, on occcassion, to over 300. Not world shattering, not even close to going viral, but satisfying all the same. And, as I've said before, at 7 articles per hit, for free, it's the best buy on the net! I have learned a few things since then, like the proper, or most effective, use of a comma in putting across a point of view. And along the way I have corresponded with many of the authors whose books I have reviewed, and a few celebriities, too. Olivia DeHavilland and Tommy Chong are still my all time favorites in that regard. And of course, becoming acquainted with record industry pioneer Eddie Ray has been a pleasant surprise, which still amazes us both. It's been fascinating to watch the process unfold, and it has given me great joy. The e-mails, and the input, which I have received from you, the readers, has been a wonderful experience, for which I am truly thankful. I still can't believe that you actually read this stuff! Ever wonder what the Marina District along the Northern edge of San Francisco was like in 1916? Or what Ocean Beach was like before all those houses arrived in the Richmond and Sunset Districts? 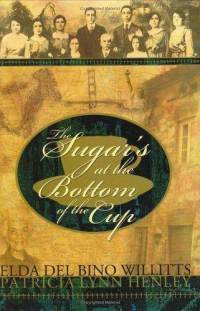 Then “The Sugar’s at the Bottom of The Cup” by Elda Del Bino Willitts is a book for you. With a sparse and direct approach to the subject, Mrs. Willits takes you back in time to an era when steamships still arrived daily in San Francisco and filled the streets with newly arrived Americans from all over the world. Adding to this mix was the influx of European immigrants arriving by train from the East. Elda Del Bino was seven years old when she stepped off the train and into the fast moving cosmopolitan world of San Francisco. With straightforward prose she vividly describes her journey by ship to New York and Ellis Island and then the train trip across rural America prior to the First World War, arriving in San Francisco in 1916. Taking up residence in the Cow Hollow area South of Lombard Street and the present day Highway 101, finding jobs, enrolling in school, learning English, Mrs Willitts draws a clear and accurate picture of San Francisco’s bygone era. Through the changes of the 1920’s and the dark years of the Depression, the book captures the flavor of a changing city. The World War Two years in San Francisco and the changes in morals and values that flowed from that war are all here to examine in the life of one elderly woman. Full of wit and inescapable charm, Mrs. Willitts has written a wonderful and informative book about San Francisco, the City by the Sea.